Beyond that, things get pretty sketchy. For one thing, all the stories about who first mixed the Ward 8, or when, show up decades after the fact. Formulas for sours are, by their nature, imprecise. Balancing sweet, sour, and spirit from one day to the next depends on the vagaries of the citrus supply and the changing preferences of drinkers. As a result, the Ward 8, with two juices, and with the unpredictable grenadine for a sweetener, is hard to pin down as far as proportions are concerned. Most respectable recipes start with two ounces of rye whiskey, then add anywhere from one-half to one ounce each of lemon juice and orange juice. The grenadine sweetener is pretty much “to taste,” and could vary anywhere from a teaspoon to a half-ounce, depending on who made it. Shake all ingredients with ice, and strain into a chilled cocktail stem. No garnish. Rye whiskey was far and away the whiskey of choice in the late 19th century, and the Ward 8 is definitely part of that tradition. Some recipes substitute bourbon—Trader Vic was one of the early proponents of that style ( Bartender’s Guide , 1947)—but this is really a rye drink, and with so many good ryes returning to the market, there’s no reason not to follow the original design. Some modern recipes omit the orange juice—no less respected a barman than Dale Degroff follows this path ( The Essential Cocktail , 2008). His Ward 8 looks like a standard whiskey sour with a splash of grenadine—a very good drink, but it seems to stray from the historic model. And that model dictates that the Ward 8 contains orange juice, which is a much softer citrus than lemon, with a distinct flavor that can lend a sense of sweetness (perhaps as much on the nose as on the tongue). Of course, there’s a potential problem there: not everyone likes the combination of whiskey and orange juice. For my taste, the whiskey/orange juice thing seems to be a matter of proportion. A tiny bit of orange juice in whiskey just tastes like sullied whiskey to me; a little more orange starts to taste pretty good. But then there comes a point where you have whiskey with a lot of orange, and that can be pretty bad again. I can’t explain that, but it certainly suggests that there is a fine personal balance at work. Grenadine is a bit of a wild card. There are many brands on the market, each presenting a different sweetness and fruit flavor profile. And there are lots of recipes and techniques for making your own. My advice is to find or make one you like, then stick to it, so you can tune your drink recipes to a known, predicatable grenadine. Some recent, well-respected bar manuals (for example: the PDT Cocktail Book and Death & Co. Modern Classic Cocktails ) have taken to making the Ward 8 with simple syrup and a dollop of pomegranate molasses. I revile the taste of cooked pomegranate, so the molasses approach is not for me, but it will keep you right in fashion if you like that sort of thing. An interesting observation, though I don’t know if that’s the rationale behind the original use of the stemmed glass for this drink. Curiously, and despite the nearly unanimous stemmed glass recommendations of cocktail manuals of the day, David Embury ( The Fine Art of Mixing Drinks , 1958) suggests that the Ward 8 is “more often” served as a tall drink, with crushed ice, and topped up with soda. The “more often” part is intriguing, given that this is the only reference I’ve ever seen about this presentation. That soda motif shows up from time to time in bar books, usually as a “splash” of soda to brighten the drink. I doubt soda in any amount was part of the original spec, but I can tell you that on days that are as hot and muggy as the day I’m writing this, the idea of a tall, icy, soda-sparkling version of the Ward 8 sounds like a very good idea, and I’m happy to consider it. So here’s to cocktail kudzu, soda, and the Ward 8 Cocktail! 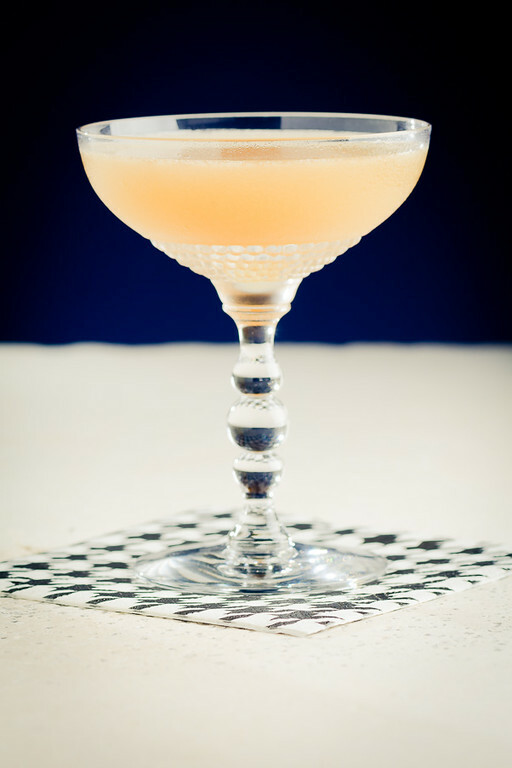 “Another Round of Whiskey Sours: the Ward 8 Cocktail” at cold-glass.com : All text and photos © 2015 Douglas M. Ford. All rights reserved. Just wanted to take a minute to tell you once again how much I appreciate this blog. Your recipes and insights are always spot on. I have learned a lot from following your postings, Doug. Keep up the outstanding work! Thanks, Jake, compliments are always uplifting and encouraging. Thank you for being an active part of the conversation. Yes, proportions for the Ward 8 seem to be all over the map. This is a version that works for me; it follows (roughly) the 2:1:1 proportions suggested by Craddock’s listing in the Savoy Cocktail Book and Gary Regan’s formula in Joy of Mixology. I backed off the lemon a bit; my lemons seem to be a little aggressive right now. But it’s a good reminder that experimentation is always useful. Thanks! I’m always excited to see a new Cold Glass recipe posted, and even more thrilled when I already have all the ingredients, as is the case here. We have been on a Jack Rose and Plymouth Rose (gin) kick lately, so the grenadine is made up. Looking forward to trying this one soon. Thanks for the best blog on the Internet! Thanks, Rhett, it’s always fun to hear that readers are finding Cold Glass useful. And that reminds me, I haven’t had a Jack Rose for ages—thanks for the suggestion. Very tasty! I used Bulleit rye, store-bought fresh squeezed OJ, and Monin grenadine (I know, I know, but I’m too lazy to make my own) and it still came out yummy. Fantastic summer cocktail. Yes, it’s a very summery item. Glad you enjoyed it. The Ward 8 was one of those drinks that showed up on a vast amount of cocktail menus from the 30’s through the 60’s. I grew up in Boston, and my aunt always enjoyed them while I was growing up in the 60’s. Most cocktails from that era were served in tulip shaped glasses, at least in restaurants that I recall (alas, I had to wait until the 70’s before I could hang out in bars). I’ve collected a lot of those branded glasses, such as the Howard Johnson ones, over the years. The Ward 8’as served at Locke-Ober in the 90’s/00’s was among the worst drinks I’ve ever had. Basically a shot of bourbon mixed with a concoction dispensed from a plastic speed pour. Similar to the equally horrible Singapore Sling I had at Raffles Hotel, carelessly served to hordes of tourists. Pitiful. Sounds like we must be about the same age, but when I was growing up, I never heard of the Ward 8, nor, I suspect, had anyone in my family. Your growing up in Boston maybe explains that. I had heard that the “modern” Ward 8s served in the years before Locke-Ober finally closed were, um, not built along the classic lines. Too bad, when you have such a heritage. I agree about cutting back the citrus if you use 80-proof whiskey. The Ward 8 seems much more solid with higher-proof ryes, and it seems easier to get the sweet-sour balance right. The Ward 8 definitely looks like a winner which I need to try. I especially appreciate how you described “”the law of diminishing returns”” for Orange Juice and Rye; I’ll have to watch that myself. Hi, Bill, that’s a good and straightforward recipe for grenadine, thanks for posting the link. I do something similar (POM plus sugar—plus some Everclear to preserve the mix), but since I don’t like cooked pomegranate, I just mix it cold. It requires patience, and plenty of agitation, and it has to sit overnight to fully dissolve the sugar, but it works. Thanks for contributing the link! I’m working my way through the Year of Drinking Adventurously and this week was rye. This was a lovely cocktail, almost too lovely! Ward 8 is a fine thing to add to your adventure. Have fun!